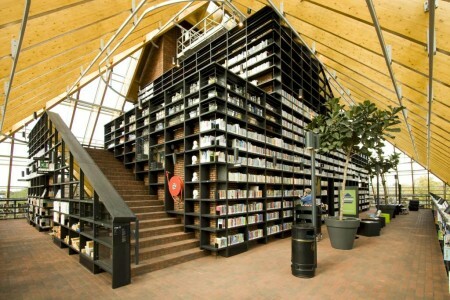 The design of the Boekenberg originates from the Dutch architectural firm MVRDV and has been given shape by architect Winy Maas. He got his inspiration from the Spijkenisse its farmers past, when the city still had only 3500 inhabitants (1940). The glass bell placed over the building, with visible frames in the glass roof, is like a large hay barn and the surrounding buildings together form the barnyard. From the outside the entire collection is clearly visible. The Boekenberg motto is: inside is outside and outside is inside. All sections have house numbers to reinforce this feeling. There are also large trees and streetlights inside the building. Furthermore, the Boekenberg is an eco-friendly and Co2 neutral building. *Sunday: open only during the months September - April, on the first sunday of the month.